Courtney Arsenault is one of five instructors involved with the TNB Theatre School this season. In addition to teaching classes in Musical Theatre Dance Technique on Sunday evenings, she is also part of the creative team behind this year’s Senior Musical Theatre production of The Wizard of Oz. With a cast of 40 students between the ages of 13 and 19, Courtney has been working alongside director Tania Breen to plot onstage movement and has choreographed seven dance numbers for this year’s show. This is Courtney’s second year arranging choreography for the Theatre School’s annual SMT production. “I like to work with the students and cast before starting choreography, getting to know their skill level and what kind of work they’re willing to put in,” said Courtney, explaining her process. As with several past productions by the Senior Musical Theatre program, there is a degree of nostalgia and familiarity associated with The Wizard of Oz, something Courtney uses as a guide to inform her work. Courtney is a graduate of the Commercial Dance Program at George Brown College in Toronto and has worked with several New Brunswick dance groups including Artemis Dance Studio, St. Thomas University’s Musical Theatre Program and KV Players. 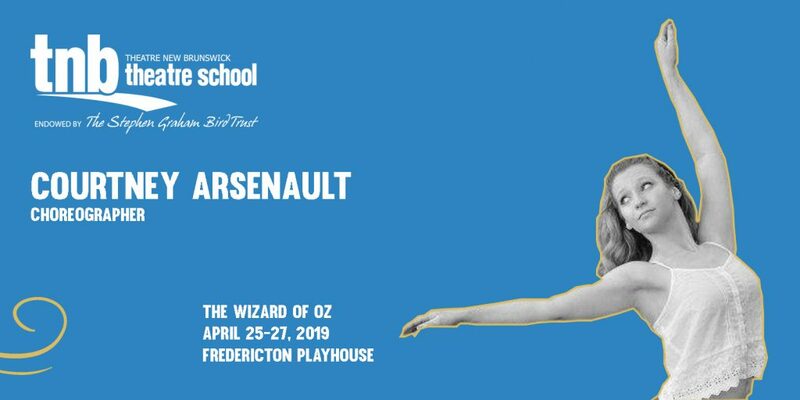 She has also appeared as a guest instructor/performer for notable events including the Saint John Contemporary Dance Festival, Connection Dance Works’ PERSPECTIVE series and the New Brunswick Drama Festival. Like all of us at Theatre New Brunswick, Courtney says her favourite part of the process is seeing the students bring the work to life on stage before an audience.